Given the near endless flow of mediocrity (and crap, to be quite honest) that's followed ever since Sonic made the leap from the Genesis, most fans had resigned themselves to the fact that there would likely never be another great Sonic game. The only exceptions to this rule (Sonic & SEGA All-Stars Racing and SEGA Superstars Tennis) were games that had nothing at all to do with the top-notch platforming that the series used to be known for. Just to be clear, we're talking about more than 20 games over the course of more than 20 years (with another likely stinker due to arrive later this year). So, in light of the overwhelming majority of garbage that the Sonic franchise has become, Sonic Mania comes as quite a welcome shock. As has become the unfortunate norm, I went in expecting very little, only to receive the surprise of (what feels like) a lifetime. 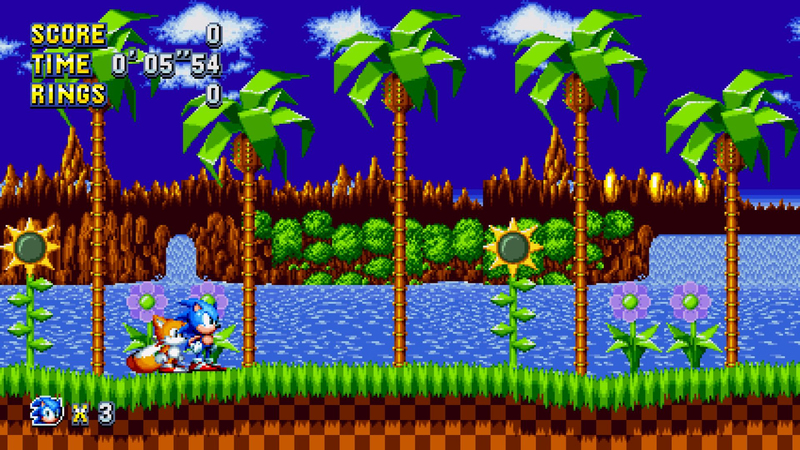 Upon being greeted by that oh-so-familiar "SEGA" logo, seeing the lovely title screen, and starting up the incredibly familiar, yet curiously new first level (Green Hill Zone, of course), I was instantly transported back to my youth. Like a retro defibrillator, Sonic Mania jolted the 16-bit love in my heart alive once again. For the third time in my life, I was blown away by a Sonic game. You are probably wondering what could possibly separate this clear success from the countless failures that preceded it. Well, the devil, as they say, is in the details; or the lack of attention to it, as is so often the case. That's where Sonic Mania shines. I know I've played this stage before, but this double-helix bubble lift is definitely new. While past Sonic games have tried to replicate the feel of the Genesis games, they always seemed to missed some (or in many cases, several) crucial elements. These elements varied from game to game. Sometimes it was the graphics, and other times it was the sound effects. Oftentimes, it was poor controls or questionable design choices that impeded the navigation of the levels. Occasionally, it was due to overreliance on gimmicky new gameplay mechanics, absurd storylines, and/or an overabundance of annoying, extraneous characters that nobody asked for. Most criminally of all, far too many times the games were simply lacking the one element that is supposed to set Sonic apart the most: speed. Thankfully, Sonic Mania got every single one of these elements right. Not only does it look and sound just like it's supposed to, but it plays that way too. Want to cautiously explore every nook and cranny of each level? Sure, go right ahead. Want to blaze right through and leave nothing but a trail of dust and shattered robots in your wake? For the first time in a long time, this game won't stand in your way. I'm also elated to report that there are no werehogs, hedgehog Uzis, unnatural human-hedgehog relationships or Big dumb cats to be found either. There is, technically, a new storyline, but it is all told through extremely brief in-game actions before and/or after certain levels. Thankfully, it never interferes with the flow of the game, and there are no CGI cutscenes or dialogue of any kind. What also helps this game to succeed is that much of it is a retread over familiar ground. (Though even that hasn't helped Sonic games in the past.) As I said before, they nailed the classic feel in every respect, so this time around Green Hill Zone actually looks, sounds and plays like Green Hill Zone. Not some cheap twilight-zone-esque knock-off version of Green Hill Zone. 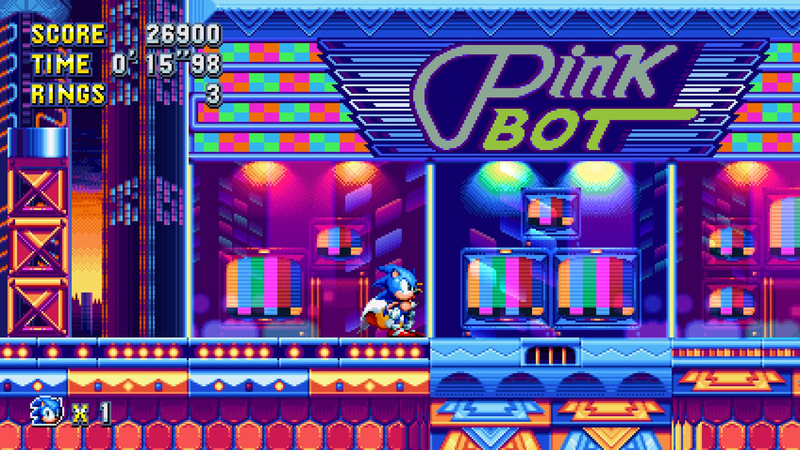 Sonic and Tails taking in the colorful new Studiopolis Zone. Even though Sonic Mania borrows much from its early predecessors, don't write it off as simply a greatest hits compilation. It's so much more than that. While the majority of zones in the game do originate from previous games, there are still enough new zones to keep things interesting. You should also know that all of the returning zones only look like carbon copies at first glance. As you move through the levels, the familiarity quickly gives way to changes ranging from the subtle to the blatantly obvious. 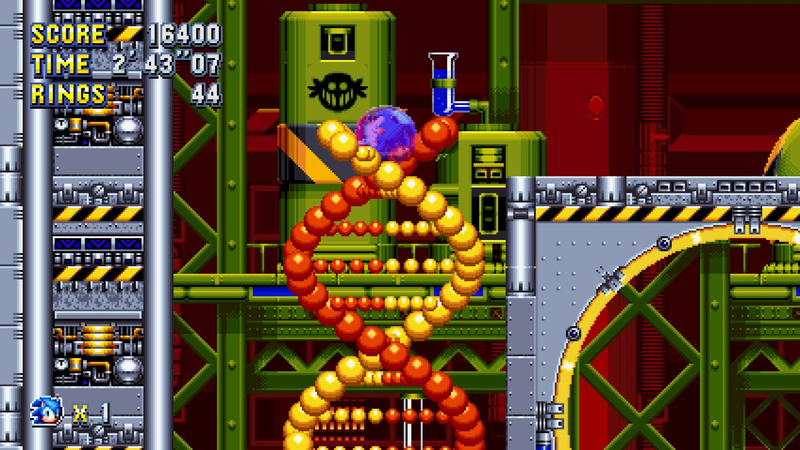 Many of these stages even offer fantastic new features to interact with, such as the bouncy-gel dispensing syringes and double-helix bubble lifts in the Chemical Plant Zone. In addition, oodles of brand new touches have been added to the game to help keep things fresh. 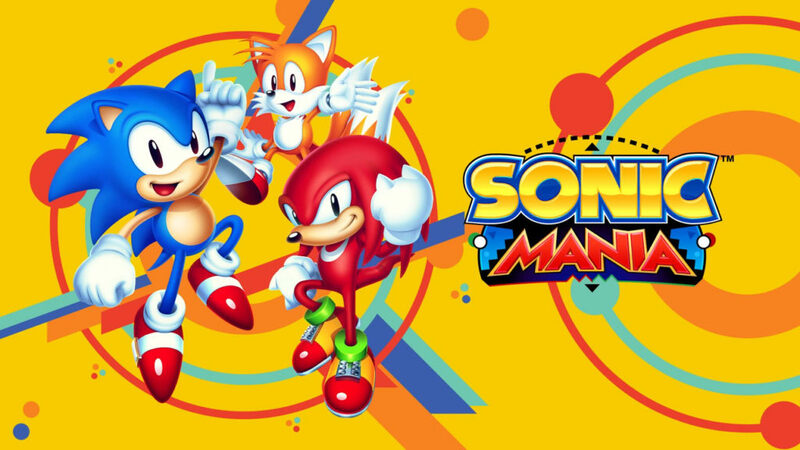 Everything from never-before-seen special effects, bosses, animations, and power-ups, to improved graphics, a new-ish special stage, updated versions of classic musical themes, as well as some great new tracks, all serve to make Sonic Mania the perfect marriage of old and new. As if that weren't enough, the game also includes some humorous Easter "eggs" and a couple of nods to non-platforming Sonic games (and even some non-Sonic games) as well. Keen-eyed Sega fans will surely get a kick out of these. 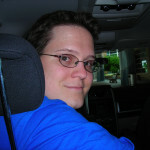 In terms of additional modes and features, the game offers a local 2-player Competition racing mode (returning from Sonics 2 & 3), a fitting time attack mode for true speedrunners (returning from Sonic CD), plus a few other unlockable extras. As in Sonic & Knuckles, you can choose to play as Sonic with Tails, just Sonic or Tails, or just Knuckles (and in case you're wondering, a second player can still control Tails while he's on-screen with Sonic). That being said, while it's great to get all of these options again, one does kind of wonder why they would just stop there. Why not take things a step further and offer us the option to play as Tails with Sonic, Knuckles with Tails, or even Knuckles with Sonic? It also would have been nice to get a true co-op option where Tails (or whoever the second player wants to control) could run off and do their own thing in the level, either via split-screen or over an online connection. Those are just minor nitpicks though and perhaps we will see them addressed further down the line with an eventual sequel. 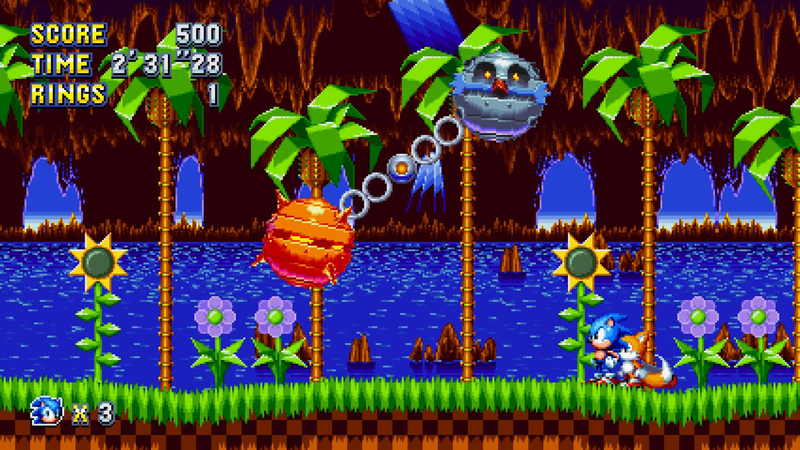 As with this boss fight, many things in Sonic Mania are different enough to intrigue, yet similar enough to please. All things considered, Sonic Mania can only be regarded as an undeniable success. It constitutes a true value for enthusiasts of great platforming and Sega fanatics alike. It's one part faithful compilation combined with one part slick new adventure, making for the ultimate Sonic the Hedgehog remix. Whether you seek joyous nostalgia or just some fast and fresh fun, Sonic Mania delivers.